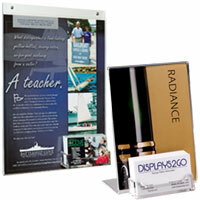 What are some of the most common uses for a business card frame in any business setting? 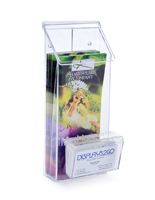 The combination fixtures are the ideal for advertising and promotional needs for any company or business. 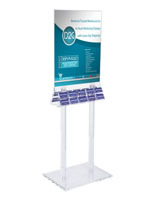 The namecard and pamphlet displays are created specifically to house all your company’s printed material and be accessible for customers, clients and guests. 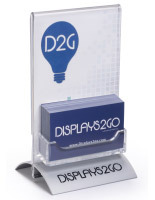 The business card frames, also known as combination stands, are made from durable acrylic to withstand use in high-traffic areas and also be cost-effective and budget friendly. 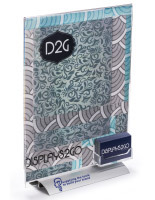 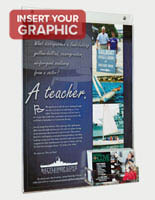 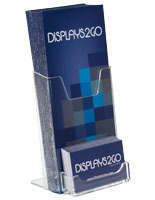 In addition for use in-house, the business card frames are portable for use at trade shows and networking conferences. 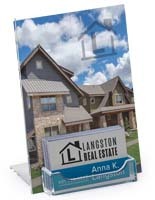 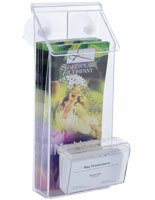 Each combination frame has a slot for brochures and business cards. 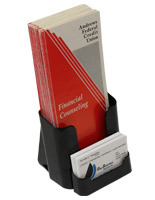 The flyer slot allows customers to take more detailed information about your company’s services or specialties while the business cards simply provide contact information for further use. 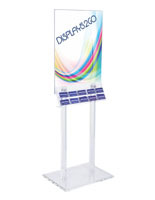 The advertising displays sit perfectly on any desk, table or booth and are easy to relocate to other areas in your lobby or waiting room. 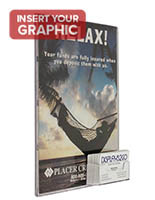 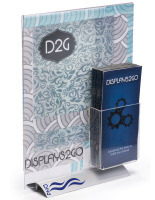 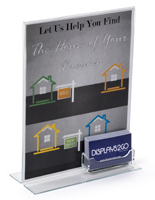 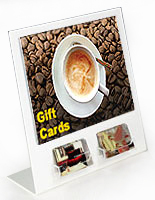 Use the plastic business card frames in restaurants, real estate offices, stores and other business settings! 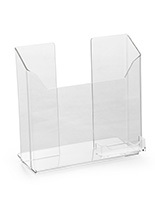 Where can these combination fixtures be used? 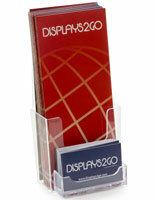 The business card frame is the perfect addition to any traditional business, company or restaurant area. 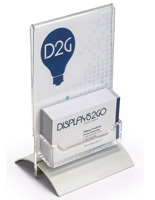 Simply place the signage holders on front desks, in lobbies or in waiting rooms to provide guests with information. 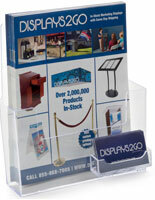 Use the promotional boxes at trade shows, conferences or networking events to promote yourself or your company. 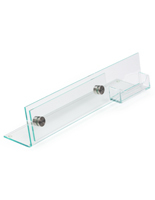 In addition to being able to be placed on any flat surface, some of the models can be mounted on the wall with suction cups or simple screws that are included in purchase. 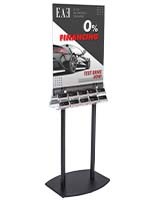 Because we know that on-to-go advertising is a huge bonus for businesses and companies, we stock a frame that is specifically designed to adhere to a cars windows. 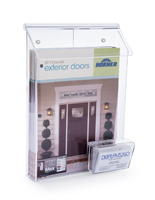 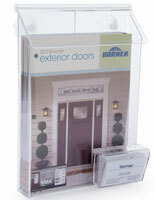 Like out other outdoor holders, this has a secure lid that will keep flyers and cards from being damaged or blowing away when the car is in motion. 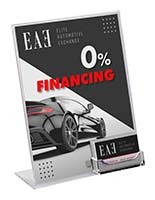 Bring your advertising out of the box and invest in an eye-catching vehicle mount. 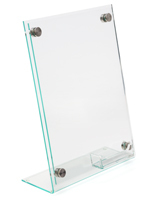 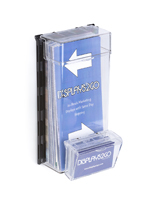 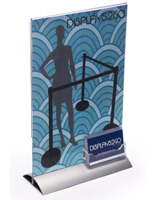 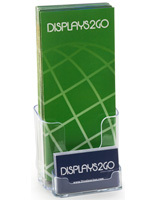 If you need a holder for a large presentation space, we stock sign holders that have 48 slots for business cards. 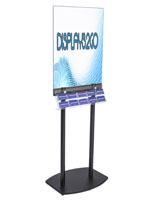 This is ideal for industrial parks or large office complexes with multiple businesses in one building. 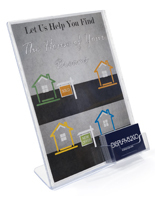 Make the most of your wall and counter space by investing in one of these acrylic, durable and cost-effective marketing tools today!